Jochen Friedrich is Chair of the OFE Standardisation Task Force and OFA Fellow. This post was originally published on his blog. The European Commission published today [1 June] its Communication on “EUROPEAN STANDARDS FOR THE 21ST CENTURY ” – COM(2016) 358. It is publicly available on the Commission website. And it comes with a Staff Working paper – SWD(2016) 186 final. As indicated by the title, the Communication sets out a vision for a strengthening and reinvigoration of the public private partnership on European standardisation. This takes into account the high emphasis policy makers in Europe are giving to standards and standardisation for promoting open infrastructures and for avoiding lock-in and silos in technology. 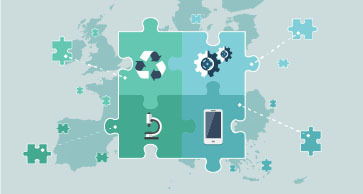 Moreover, standardisation plays a key role for market access in Europe and for meeting regulatory requirements – preferably by the use of international standards that are adopted as European Standards and are listed in support of EU regulations under the New Legislative Framework (New Approach). I took a first reading of the Communication and I am happy to share some initial reactions. Before listing them it is worth mentioning that this Communication puts itself into a network with the other documents recently issued by the Commission, in particular with the Communication on ICT standardisation priorities (see my recent blogpost on that). I like the stress on standards being voluntary and industry driven. This is at the core of the European standardisation system and is working extremely well. This also includes the mechanisms of the New Legislative Framework and the access to the harmonised European market under the presumption of conformity where regulatory requirements may be met by standards. I would like to add that it is important to have expertise from industry who is the main contributor to standardisation, not to overstress resources, to avoid duplication of efforts and to rely on bottom-up processes for standardisation. I stumbled a bit at the sentence on page 2: “While standards are developed by a standards organisation, the market may also simply adopt the technical specifications developed by one company or by bodies active in the field, i.e. professional organisations. ” I am wondering for what reason this was added. In my opinion adopting a technical specification developed by one company is not really adopting a standard. I know that sometimes people use the term proprietary standard which I find a contradiction in itself. I would propose proprietary technology, instead. And this should not be confused with a specification developed by a professional organisation, e.g. the association of electrical engineers or something like that, because the latter does have openness and plurality while proprietary technology is proprietary technology. I like chapter 1 – Standards matter… It highlights the right aspects and show the spectrum of where standardisation plays a role and needs to be considered. Regarding the economic impact of standards to enable jobs and growth I am a bit less optimistic. I don’t think that standards are as such a guarantee for jobs and growth. They are just one possible factor that may support growth and innovation – provided that all goes right and the standard meets a market need and gets widely adopted. Figure 1 (at the end of chapter 2) is interesting proposing a visualisation of the European Standardisation Value Chain. I would like to discuss that and understand better. But it is certainly a great visualisation of the thinking around creating new dynamics for European standardisation. ICT standards – chapter 3: I like the section. It correctly expresses the benefit of ICT standards in considering openness and interoperability: “Encouraging open standards is of particular importance for the Commission. Open and cross-cutting ecosystems for standard development should be preferred to proprietary solutions, purely national approaches and standards that limit interoperability. ” (p. 9) It is worth noting that such ecosystems include global standards bodies – often referred to as fora and consortia – as they are of highest importance and provide many of the most innovative and widely used global ICT standards. Services standards – chapter 3: I want to read the accompanying staff working paper first before going into details. Services standards deserve a number of blog entries. There is a very fine dividing line between services standards and management systems standards. Therefore, a clear market need and the impact on those who need to implement the respective standards needs to be considered. The Joint Initiative will leave room to really fill all this with content and further new and fresh ideas and further drive the momentum. To conclude for today, I think the Communication nicely promotes standardisation and takes a powerful and fresh approach to reinvigorating the potential of standards and standardisation. The Joint Initiative will leave room to really fill all this with content and further new and fresh ideas and further drive the momentum. I am looking forward to all of that.